Legacy Double Hung window with bullnose sill. We offer the most flexibilty in choices of window options with Grill Between the Glass (GBG) and Simulated Divided Light (SDL) grids. 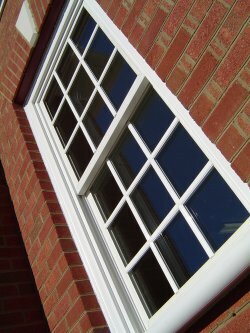 1" contoured GBG is standard in all windows and optional on casements and specialty windows. By combining 1" GBG with our SDL bar on the outside, you can have the appearance of a true divided light window from the outside, coupled with the easy to clean GBG inside. Or you can get SDL on both sides with a Shadow Bar between the glass for the truly authentic look of divided lights. Legacy Windows: Blending traditional design with modern materials.